Mention the name "Confederate prison camp" and you'll likely come with the name "Andersonville." 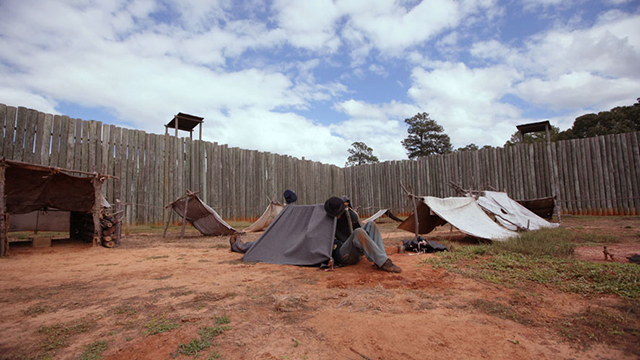 Andersonville was arguably the most notorious prison that housed Union soldiers during the Civil War, which killed more than 600,000 Americans from 1861 to 1865. Time Team America is looking for another encampment, which Union Gen. William Tecumseh Sherman found on his march through Georgia near the end of the Civil War. Sherman didn't just stop and look at the site. He burned it to the ground after freeing the prisoners. As one scientist tells it, the team had a "Pompeii phenomenon" on its hands, only without a volcano to study. Panhandle PBS will show Time Team America's search for Camp Lawton at 7 p.m. Tuesday. Camp Lawton housed about 10,000 Union soldiers. As Gen. Sherman's forces approached the camp, the soldiers guarding the prisoners fled quickly, reportedly leaving the camp and its exact location a mystery to historians. PBS's Time Team America seeks to uncover the mystery of Camp Lawton. Camp Lawton was reportedly the largest prisoner of war camp of the Civil War. Time Team America sets a three-day time limit to find the site. Time Team America brings together leading archaelogists to scour sites for remains of their targets. Camp Lawton is the latest in Time Team America's targets.